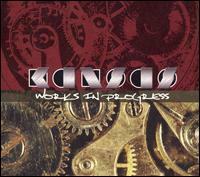 Review: "Kansas: Works in Progress (CD/DVD)" - Sea of Tranquility - The Web Destination for Progressive Music! Once you get past the question of why Works In Progress was even released, you can enjoy this eclectic collection of latter-day Kansas material spanning three albums and two concert videos recorded between 1992 and 2002. Granted, this was not the band's proudest period, with 1992's Live at the Whisky, 1995's Freaks of Nature, and 1998's Always Never the Same (recorded with the London Symphony Orchestra) all receiving little commercial (or critical) acclaim. But each of those releases, now out of print and hard to find, has its moments. Works in Progress culls the best of those moments, plus four songs from 2002's better-received Device Voice Drum DVD, filmed at EarthLink Live! in Atlanta. For some reason, material from 2000's Somewhere To Elsewhere, featuring original guitarist Kerry Livgren, is missing from the CD, but the performance of that album's "Icarus II" from Device Voice Drum is included on the DVD. Putting aside the multiple fashion faux pas committed by Kansas on Live At the Whisky � most heinously by croaky vocalist Steve Walsh, whose tight blue jeans/red spandex combo and way-too-small denim jacket vest must have practically destroyed the band's credibility and legacy at the time � this era revealed a band of seasoned road warriors. Violinist David Ragsdale firmly established his presence after the temporary departure of Robby Steinhardt (who recently left the band again) on "Mysteries and Mayhem," "Portrait (He Knew)" and "Down the Road" � three of Kansas' heaviest songs. Five tracks from Freaks of Nature (more than half that album) represent a record that actually deserves reconsideration, especially the rockers "Black Fathom 4" and "Under the Knife," plus the ballad "Peaceful and Warm." Meanwhile, the symphony on Always Never the Same doesn't add as much as it might have on paper to "The Wall" and "Dust in the Wind," which were already somewhat orchestral in their original versions. "Hold On" fares best here, and the DVD offers 5.1 surround-sound audio remixes of that track and "Dust in the Wind," although video footage of those sessions � or from the subsequent tour featuring performances with local orchestras � would have added more value to this package. Works in Progress ends with four clips from Device Voice Drum, a classic (and classy) set that finds Walsh returning to near-vintage vocal form and one that goes a long way toward proving why � after so many career ups and downs � the men of Kansas still deserve to be called elder statesmen of progressive rock. No other band has really quite melded the sound of classic British prog and American heartland rock the way these guys do. Works in Progress is not for everyone, and it's not even for every Kansas fan. But if you're not familiar with any of the titles featured on this collection, here's your chance to find out what you missed.